October 29, 2011. It is snowing. Not just a dusting. Southern New England is expecting 6 to 18 inches of snow by tomorrow morning depending on location - we should get 8 to 12 inches here. These pictures were taken at about 1:10pm Saturday after about 45 minutes of snow fall. Even Benni isn't too thrilled with the prospect of winter snow. We are hoping to have Indian Summer next week. While so many of you were watching Glee on Fox, Leon and I were catching up on True Blood, Dexter, Drop Dead Diva, and several other past and current TV series. When we finally discovered Glee on Netflix, we watched every episode. It is cute, funny and smart. The humor reminds me a bit of Psycho Beach Party with a bit of Fame mixed in. My take on Glee is that the high school Glee Club has come a long way since 1966. I was in our high school Glee Club even though I'm tone deaf and have a range of about three notes. I would mouth the words when I couldn't reach the notes. I'm not sure why they kept me - maybe the good sister felt I needed some extra curricular activity or that I fit in with the Glee Club crowd, or they needed bodies to fill up the stage. I got dad to help me print up silk screen posters for our annual concert. That was my major contribution. God knows I couldn't carry a tune. It's been a busy few weeks so haven't been posting much. Been to the airport more than I do in a year. Thank goodness I'm retired! Tuesday (tomorrow) 4:00 am bring Leon's brother to the airport for a 6:00 am flight. I appreciated David F's column in the October 14 edition... Quite honestly, I was surprised that the topic (disparity between the super rich and the the rest of us) was broached - and so well put. I agree that "something is out of whack" and it has been for more than 10 years. When I worked for a homeless shelter several years ago the working poor had already begun falling into the growing abyss between the wealthy and the indigent. Foundations whose mission it is to fund charities began cutting back on grants because they were losing income on investments - as Wall Street moguls, bankers and financial gurus raked billions off the top. When Obama ran on a platform that endorsed a return to previous tax rates on the wealthiest segment of our society, I had hope that things would turn around - that all Americans would have adequate health care, that seniors would be taken care of, that the quality of education would improve, that our infrastructure would be maintained. President Obama's every attempt to fix what's been "out of whack" has been met with obstructionist tactics by those who hold majority status in the Congress. What irks me is how they then blame Obama for lack of leadership, having no ideas and not getting anything done. [When it is they who have prevented any and all of his policies from becoming law] How ludicrous! I think its about time that a large-scale protest movement has been launched against the corporations, the Supreme Court's granting them personhood, and against the greed and corruption that is bringing this nation down. (Really, it warms my heart to see young people with a cause other than their iPhones). It is long past the point of trying to effect progressive changes through a corrupt, political process - because the process has been dysfunctional for years and is now being bought and sold by politicians and the highest corporate bidders. But there is a danger for the movement to become fragmented by different, extreme ideologies and persons with destructive agendas. It would be most unfortunate for this fledgling movement to implode before making a real impact. As a "veteran" of the 60's and 70's idealism and the peace movement, etc. I have seen how easily such calls for change and reform get amalgamated by the media, pop culture and political mainstreamers. And how we are worse off in many ways today than we were then. But I still think it is about time people take to the streets one again. The teabaggers did it - can you believe conservatives protesting,? how un-American. Conservatives sure didn't complain about teabaggers protesting. But they are quick to call the Occupy Movement communist and socialist and anarchist. Liberals and progressives are certainly better at protesting than the teabags. And because it is a populist movement it will exhibit some extreme elements - after all, there are a lot of unhappy, frustrated people with different liberal and left-leaning ideologies making up the masses. Conservatives are right about one thing - they SHOULD be worried about the Occupy Movement - they are all likely to loose their jobs and a good chunk of their wealth if the Movement has the influence it seeks to have. But they are desperately trying to dismiss this movement by using whatever scare-tactics they can muster. And they are so good at using scare tactics. The protests' initial focus on Wall Street was logical, but the focus needs to widen, as I think it has. I should think that an "Occupy the Republican Convention" might be a future step for the bravest members the movement. And I can see pickets in every state through the 2012 elections calling attention to the selling of democracy. I think things are just getting started. NOTE: See comments for more on this. See a nice tribute to Frank Kameny, one of the earliest Gay Rights pioneers, who died yesterday: links at I Should Be Laughing and at Pam's Houseblend and at Towleroad, among others. It is important for us to keep our history alive and pass it on to the young ones. Also, it is the 13th year since Matthew Shepard was brutally murdered because he was gay. The above mentioned blogs have posts on this as well. 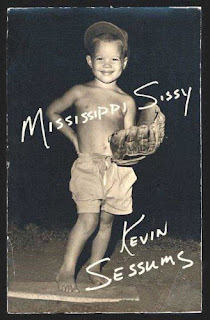 Picked up this Audio Book, an abridged version of Mississippi Sissy by Kevin Sessums at the local discount store. The story is a memoir of a sissy boy growing up in a small town in the Deep South during the 1960's. Sessums' mastery of language and the fact that he reads the story with full dramatic effect easily makes a movie in your mind as you listen. Kevin was one of three children. His father, an athlete and a coach was frightened by his boy's "in-your-face" and unabashed sissy behavior, while his mother always encouraged him to be himself and nourished him with literature and the arts. Both parents died within a short time when he was just a child. His recollections draw vivid pictures of life in the South, with colorful, interesting, and sometimes frightening characters taking the stage. Sessums skillfully weaves intriguing details into the narrative and returns to those very details when their significance is fully revealed and they will have the greatest impact on the reader/listener. Kevin Sessums, in Mississippi Sissy, lays it all out for everyone to see. It is a life revealed with brutal honesty and told with an underlying compassion and love that makes even the most horrific events palatable. I listened to this on the car's CD player over the course of a few days while doing short errands and often sat in the parking lot or driveway because I hated to "put the book down" so to speak. Highly recommended. The subject of this book dovetails nicely with my last post about the website "Born This Way", see below. Check out this website - "BORN THIS WAY" - a place for GLBT folks to tell their childhood stories of how they knew they were "different" at an early age. Russ from Blue Truck, Red State posted about this one back some months ago, but it's worth another mention. The initial scene with Josh's angst and indignation about his boyfriend cheating with a guy at the gym was just too familiar - it hurt. I was reluctant to keep reading, but, thankfully both the writing and the story line improved in subsequent chapters. Josh, the storyteller, heads to PTown for a few days to clear his head and emotions after learning about his boyfriend's infidelity. The few days becomes an entire summer of new friends and assorted characters: there's Ted and Ben, the owners of a guest house where Josh lands and who made me think of the Hat Sisters; Jackie, the dyke who owns a restaurant, and wants to have a baby; Toby, the gay teenage runaway; Emmeline, the Southern born M to F transsexual nightclub singer who wants to make her transition complete; Reilly, the butch townie carpenter who is engaged to be married to his childhood sweetheart; Ty, the hot new Hollywood star who is in the closet but in love with his producer and a cast of other more or less interesting characters. Michael Thomas Ford draws his characters with adequate depth and personality and they are able to tap the appropriate emotions to keep the reader engaged in the unfolding events. 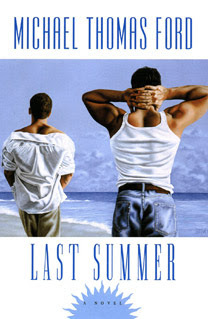 Last Summer may not be the great American Gay Novel but it is rather quintessential; it is light, humorous and entertaining. The style is almost too conspicuously similar to Armistead Maupin's Tales of the City, with the characters weaving in and out of one another's lives in short, fast moving chapters that keep the reader wondering what will happen next. Grab this book and a lawn chair , pour a gin and tonic and put an ocean soundtrack on your iPod. You'll enjoy a trip to a somewhat surreal Provincetown.